I confess that after more than four decades as a parish priest, I am still moved by the Scripture readings of Ash Wednesday. That is true even if there may seem to be contrasting expectations. Likewise, when it comes to fasting, Jesus calls people to “anoint your head and wash your face, so that you may not appear to be fasting.” At the same time, we place dark ashes on the foreheads of adults and children alike as a sign of their repentance. Are we ignoring Jesus’ challenges to attend to the inner life of the soul without being showy? A closer look at both readings will ease some of the apparent conflict. It is very tempting for me to spend the entire Ash Wednesday homily preaching on Matthew’s passage about almsgiving, prayer and fasting. After all, they summarize the traditional ways to seek a change of heart and a renewal of spirit through repentance. What Joel calls people to is a major renewal of heart and spirit. His words are really a rallying cry. Thus the blowing of the trumpet is to awaken people to the need to universally and collectively change their lives. 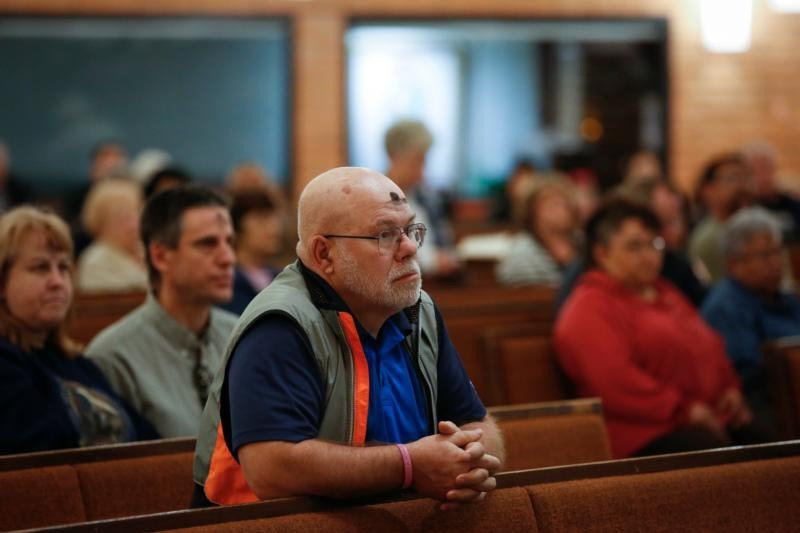 Many people implicitly understand that Ash Wednesday is a rally of sorts. What will follow the next 39 days is equally important, but people need to be given encouragement and motivation. That also explains why gathering as a group and not just praying alone is important. We gather with fellow sinners admitting our sinfulness and looking to God’s mercy. In recent years, I have begun washing off the ashes on my forehead shortly after each Mass. I do this in the spirit of Matthew’s Gospel reading. As I wash, I often pray that my heart will wear this sign of repentance for the next six weeks. At the same time, I know that people need visible and exterior signs, so if the ashes are worn for that day alone, the symbol can be seen, not unlike wearing a cross around one’s neck, as a sign of going beyond the immediate pleasures and gratification of this world. Again this year we will rally for the beginning of Lent with the Scriptures reminding us of the call to true renewal.